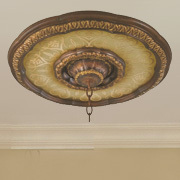 Are you shopping for new ceiling lights for your Houston residential or commercial space? 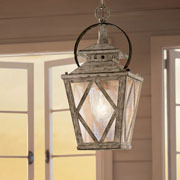 With thousands of affordable styles to choose from, the design options are virtually endless for lighting your interior spaces, and it is easy to strike the right balance between function and beauty. 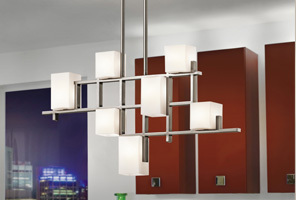 Whether you are searching for the right chandelier to complement your dining room, flush-mounted fixtures for ambient lighting or multisystem lighting solutions to provide stylish task lighting, the experts at M&M Lighting have your needs covered. We’ve been serving the greater Houston area for more than 50 years, and we are proud to offer high-quality lighting products and excellent customer service. To discover the wide variety of ceiling light fixtures we offer, browse our online catalog now or stop by our Top Rated Local® lighting showroom today! Ceiling lights are some of the most important types of lights you can have installed in your home, as they are commonly used for ambient, task and general lighting sources in a room. Their functionality and design can be extremely versatile, depending on the type of ceiling lights you choose for your home. Think about all of the busiest areas in your home: your kitchen, bathrooms, laundry room, bedrooms, hallways and foyer. These are all places that can benefit from having ceiling lights installed, even though they each serve different purposes. That’s where you can get creative and customized with the type of ceiling lighting you choose. 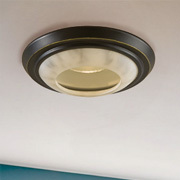 All of these ceiling light types are unique and serve an individual purpose. Some are more functional, such as flush mounts, whereas others are utilized to add beauty and elegance to a room, such as chandeliers and pendants. If you have any questions as to what type of ceiling lights will work best in your home, don’t be afraid to get assistance from one of our lighting consultants. We have years of experience working within our customers’ budgets, finding them the perfect lighting styles for their home. Schedule an appointment today. When you’re selecting ceiling lights for your home, you want to ensure you choose light fixtures that will adequately complement the rooms in your home. By choosing the right size for your light fixtures, each room will be properly illuminated and will also look intentionally amazing. 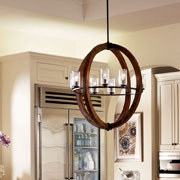 You need to measure various aspects of the room before you choose a light fixture like a chandelier or pendant. 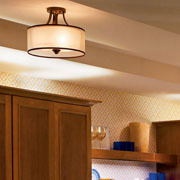 Think about it this way: if you choose a light fixture that is too small, your room will feel uncomfortably large. 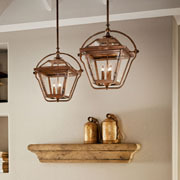 If you choose a light fixture that is too large, your room will feel cluttered and overwhelming. We’re talking about finding Goldie Locks lighting here — your ceiling light size should be juuust right. To scale the room, you need to determine the diameter and the height of the light fixture. This measurement is important to make sure the taller people in your household are able to walk around and under any ceiling lights comfortably. The necessary clearance suggested varies for each room. For your bedrooms, foyers or living rooms, there should always be at least 7 feet of clearance between the light fixture and your floor. For your bathrooms, you should hang any light fixtures at least 8 feet above the clearing of a bathtub. Pay attention to your spacing. 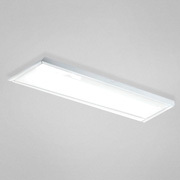 Spacing essentially means the areas on your ceiling where you install your ceiling lights. You don’t want the rooms in your home to be overbearing when it comes to their lighting, but you also don’t want them to be under-lit. 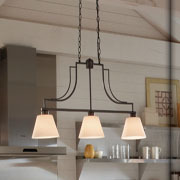 If you’re hanging a ceiling light fixture above a table, make sure its width is at least 1 foot shorter than the length of the table on either side. 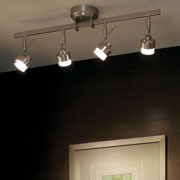 Ensure that if you’re hanging several ceiling lights, you space them evenly. For any further assistance, ask for help from one of our lighting professionals. 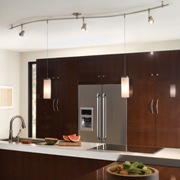 We are trained to help customers not only choose the right light fixtures for their home but also properly place them. If you’re searching for high-quality, top-brand ceiling lights at affordable prices, shop our collection today at M&M Lighting. 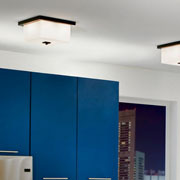 You can browse our lighting solutions either online through our catalog or by visiting our Houston showroom. Schedule an appointment with a lighting consultant today to get help finding the ideal ceiling lights for your home or business. For additional tips or advice on finding ceiling lights best suited for your style and budget, read our blog here.